Top 4 Efficient Niches To Select For Blog/Website That Always Grows Smarter! Top 4 Niches For Blog/Website! Hello there, bringing you up the nicest niches(Ideas to blog) that you can start up your blog to have a good time through earnings and traffic. Looking to start a BLOG? Don't know what topic to select? Here I came up with four killer niches that always grows up when people put efforts on to it means(Search Engine Optimized) all I did is gather the information around from other websites and search engines and find the most popular blogs and the reason of them for being popular so here I will share you the niches along reasons why they earn good and have good time,Below are some niches and reason why they always grows up but, can you grow up the right way? If yes then good else select your niche and check out my other SEO HELP for you and grow quickly. These are the 4 killers niches and the ideas among them and why I'm sure they will grow, find your niche with the reason! I ranked technology number #1, because today the world is being getting developed at its fastest when it comes to technology and everyday some technology comes around many companies introduce new tech based stuff. This is why this type of blog will ever have the benefit to be updated! Getting into it what I really mean by Physical tools? Any equipment that you create or purchase to sell that is they actually matter like clothes,bags etc etc are the fastest growing blogs/websites when it comes to online shopping, In this type of blog you don't need to wait for your blog to be old if you're selling something needy you will find people attractive, this kind of blogs always have fruitful results! Make sure the only difference between Physical tools and online tools have that online tools don't have any physical appearance! So why these blogs get high traffic ? If you survey others website and gather some information about these websites they are always having good time serving/selling people their new great stuff. Lets take a example here of a computer/software engineer who is expert in his field, if he start selling his new helpful software that enhance other machines and shows up amazing tips and tricks everybody would love to get enjoyed by them! In my opinion, educational blogs are much more than to be ranked, these are all top blogs that literally help a lot they are on another level and these are the blogs which always having traffic no matter if you content is too old, student will always find it worthy and you will keep receiving the juice of your hard work on the content forever, as a student I know how much these blog literally help me! Selected your Niche? Don't know how to start a blog then click HOW TO START you may also like how to enhance blog ranking among other blogs and get more from here ! 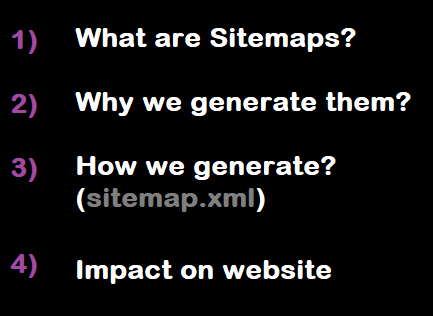 Why And How To Generate Sitemaps For Blogger aka Blogspot ! Hello peeps, welcome back to another SEO content! Sitemaps are having bigger impact on the number of indexing, google robots and crawlers do for your content to be displayed in the search engines ! Sitemaps or sitemap.xml are the best part of boosting your blogger rank as well as showing your data perfectly on the search engines, when search engines crawlers or Google robots crawls your data. Making, generating sitemaps are beneficial for the growth of your blog, this increase the growth rate of blog as well as increase the rank of blog among other blogs/websites worldwide! I want to clear you all the bloggers, In start I had no knowledge about SEO nor the full form of it and that that my journey so hard even having good stuff on website I was not reaching any good ranks, SITEMAPS are the very initial,basic and important part to index all of your content on search engines. There are millions of website and when it comes to crawl the data, index the data on search engines. Google and other search engines are not able to do it manually and I believe no one in the world is able to do so therefore, Google has robots which do this job for google, they are slow and do the process but they are not enough efficient to know which exactly page to index, their is a limit set by google as blogger use atom feed which limit auto indexing of all web pages therefore, we generate SITEMAPS. To see what google robot actually do with your blog! Without making this part longer for you, just simply copy the right code according to number of content your blog got as mentioned below and add the following code in your sitemap section at Google Search Console. WHERE TO INSERT SUCH CODE? Click Add/Test Sitemap a popup will be opened paste your line of code and press SUBMIT and that's all. After adding the code above, adding the sitemap your blog rank will start boosting because google will start indexing all of your web pages. It takes like hardly a week for google to track and indexing all of your web pages but once it done you will surely find your growing rank wisely in a great flow! If you're looking to enhance your blogger aka blogspot rank and make it better throughout search engines then these 5 basic SEO tips will surely help you up! make sure not to touch anything else without knowing it because that may effect search engines to stop indexing you or prevent them completely! Read a step and follow it step by step ! I believe Blogger is a very good platform for blogging but as compare to WordPress handling of SEO services is hard here, therefor I wrote this small documentation on how to boost up your blog and how to promote your website through SEO tips and tricks in 2019 to keep search engines indexing you, some SEO tips and tricks for website are mentioned below ! Meta Tags and Search Description. I believe having a unique and meaningful name is worth to be a domain name, as per domain having a domain name which is keyword means(exact words to be search on google by majority) is a great advantage! First of all when you purchase a domain name for your blog I suggest you that find good keywords that match your blogger niche means(blog topic) and amount of letters must be in between 5-15 for a perfect SEO filtered name! Blog headings are the main part of any content, they describe what the paragraph below it is about like above heading describes what are we going to talk about in this paragraph! In SEO services we use H1 for titles and H2 for body headings! Now search H3 and replace every H3 with H2 then click save theme! Again go the dashboard and click settings from left bar and here click search preferences! Here you will find META TAGS on the top of page just opened, this contains maximum of 150 words but they are more than enough, here give a brief description about your blog that truly describes your blog. It helps search engines to index you when someone type same key words you put in that box. 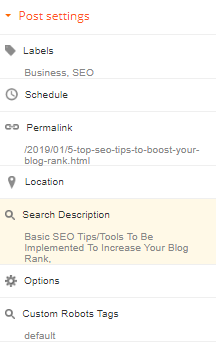 It also enable the option of search description in post settings, type the best keywords here to boost your post. Enable Custom Robots.txt and copy data below in that portion and save changes. KEEP IN MIND TO CHANGE MY DOMAIN NAME TO YOURS!! 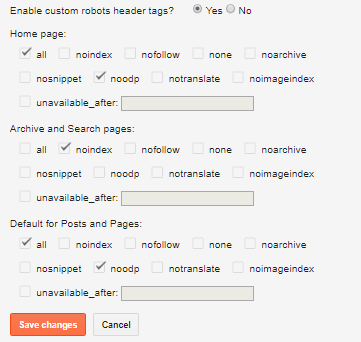 Enable Custom Robots header tags and set changes and describes below and save changes. Enable Monetization(if you're using GOOGLE ADSENSE ACCOUNT FOR ADS) below on the same page and paste the following code below!